Triana struggled with depression since third grade and frequently cut herself. On several occasions, she even made plans to take her life. Years of medicine, psychiatric treatments and placement in institutions haven’t removed the darkness that seemed to smother her life. A difficult relationship with her mother, Denice, did not help. Denice and Triana’s friends, Charlie and Jo Alegria, could see their struggle. They spent weeks praying for the mother-daughter duo as well as other friends and family members they invited to attend their “home blessing” party on Nov. 6. 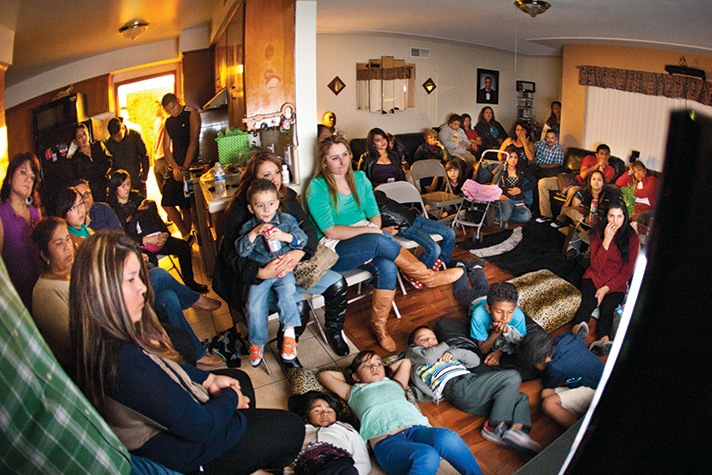 For more than a year, the Alegrias’ home in El Cajon, Calif., had undergone a major overhaul. They planned to unveil their remodeling efforts at the party while using the occasion as an opportunity to serve as Matthew hosts in the My Hope evangelistic outreach. Triana and Denice were among 16 people who attended. As the program began, Triana was sitting in a rocking chair in the center of the room, directly in front of the TV. Her black and tan sweater was covered with crosses, which she liked because of their design. But she was about to hear the spiritual significance of the cross of Jesus. Triana watched as Christian singer Lacey Sturm talked in the video about once loathing life so much that she planned to kill herself—until God intervened. And like Lacey had done years earlier, Triana prayed to receive Jesus as her Lord and Savior that night, as did her mother, Denice.